Kikkan Randall modeling the U.S. 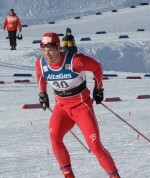 Ski Team suit for the 2010-2011 season. Photo courtesy of the U.S. Ski and Snowboard Association. In the sport of cross-country skiing, most people would agree that competing with New Zealand is probably smarter than picking a fight with Norway. Consequently, the U.S. Ski Team (USST) will be wearing black suits for the upcoming season, eschewing the red spandex that has been the norm for the past few years. After any number of years of being drowned out by a sea of Norwegian crimson, U.S. Ski and Snowboard Association Nordic Director John Farra said that the USST will be “distinctly not red” for the 2010-2011 season—including at World Championships in Oslo. “We went in a very different direction, in part from our experience in Oslo, where they [Norway] have a nation’s group of ten, and we can barely see our athletes in the group,” he said. Both the U.S. nordic combined and cross-country ski teams will wear the new suits all year—Farra said that there will not be a special outfit for World Championships. The American uniforms are supplied by BJ Sport, the Oslo-based firm founded by Norwegian legend Bjoern Daehlie in 1996. Billy Demong training in the new suit earlier this week. Photo courtesy of the U.S. Ski and Snowboard Association.